50 custom made costumes. 400 total. What is this? 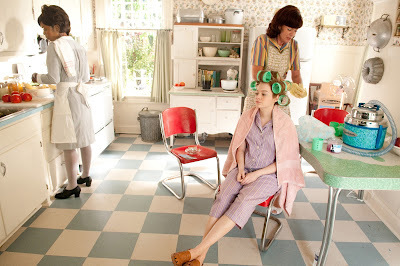 This is "The Help," the Oscar-nominated film about racial segregation in the South through the eyes of women. 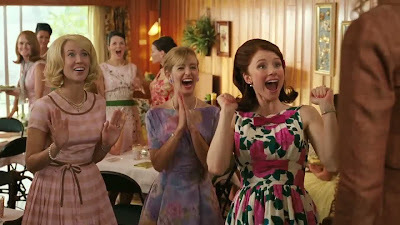 "Pan Am" whetted my appetite for the fashions of the 1950's and 60's, and "The Help" delivered a wonderful trove of beautiful pieces. Although it missed out on an Academy Award nomination, it nonetheless is a piece that any costume geek should check out! Want to read more? Check out one of the links I've collected for you! Director Tate Taylor talks about the costumes in "The Help." 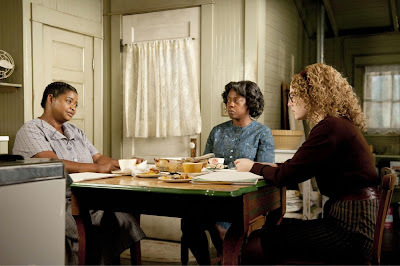 Jessica Chastain as Celia with new maid, Octavia Spencer as Minny. Celia's wardrobe was designed to evoke icon Marilyn Monroe. Like Monroe, Celia came from a humble background and struggled to fit in a society drastically different than she was raised in. 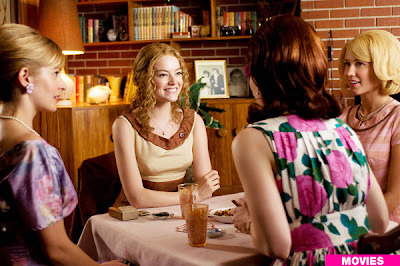 L-R, Ahna O'Reilly as Elizabeth, Emma Stone as Skeeter, Bryce Dallas Howard as Hilly, Anna Camp as Jolene. Just look at the lovely frocks these ladies are wearing to bridge club. Yes, bridge club! Not church, not a party, but weekly bridge. Ah that we still had such standards! Note how each dress fits the wearer. Skeeter is plain, tailored, unobtrusive but well made. Elizabeth is delicate, pastel, homemade. Hilly is bright, loud, overly gathered. Skeeter appears more feminine on her date night out, wearing a brighter-than-usual dress with lovely organza detailing on the neckline. 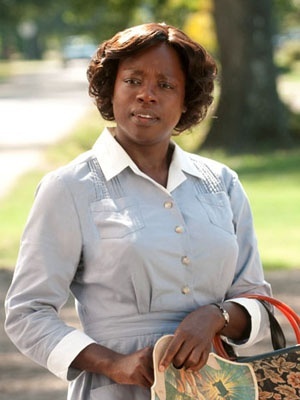 Viola Davis as Aibileen. The gray dresses worn by the maids might appear simple, but don't overlook the bit of detailing on the shoulders! Celia and husband Johnny (played by Mike Vogel). Celia's dress would still be shocking by the town standards, but she's gaining a sort of elegance. Like her cooking skills, she's becoming a mature married woman of higher class, no longer the frightened young girl from the hicks. Skeeter and mother Charlotte (played by Allison Janney). Ah, and look at this contraption Skeeter's mother ordered in to get her girl's hair up in curls! I don't even want to know how that works. Minny and Aibileen head up the maids for the benefit ball. During the day each woman has her own distinct uniform, but tonight they are matching as they act as wait staff. Even their personality is stripped away here. Jolene, Elizabeth and Hilly show delight and a better view of their dresses. Here you can see Jolene's pink and prissy dress a bit better. Skeeter, Minny and Aibileen after church. Here we see the maid's true personalities emerge in their clothing with bright and rich colors. Minny, Aibileen, and Skeeter. Again out of uniform, the maids dresses are not particularly notable here, but Skeeter's ensemble is quite classic and displays a bit more care for dress and color than she normally displays. 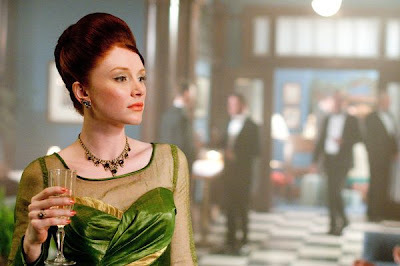 I wasn't able to find a full length picture of Mrs. Hilly Holbrook's gown for the benefit, but it was gorgeous! Bright but with exquisiteness structure and hints of gold, she's obviously intentionally appearing the queen of the night. Welcome to the discussion! Please note that due to chronic illness, I am no longer taking commissions of any kind. Follow me on Facebook or Instagram for links to articles I find interesting my sewing updates! Due to health issues, I am currently unable to sew, and I will not be taking on further costume commissions for the foreseeable future. The Costumes of "The Adventures of Robin Hood"
Join the Queue Opening Alert! In what order should you fit a corset? WANTED: Once Upon a Time Costume Photos! Heels - Love 'em or Hate 'em? So you want a career in Fashion?